We specialise in creating gorgeous flowers for weddings in Dorset, Hampshire, Wiltshire and beyond. Led by Jen Poynter, winner of several regional and national industry awards, we’ve created fabulous florals in most of the major wedding venues around Bournemouth, Poole, Christchurch and The New Forest. Years of professional experience have proved to us that no two events are ever the same; each deserves a fresh approach and bespoke design. We guarantee quality and service from the first consultation to the final flower, delivered with a big fat dose of excitement! If you’re planning your wedding or a special event, please get in touch to find out how beautiful your flowers could be. 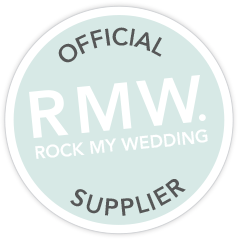 Every single thing you delivered was so bloody brilliant – bouquets, buttonholes, crown, HANGING FLOWERS! Everything. Our forte! From your stunning bouquet to full venue décor… colour, texture and style are combined to compliment the feel of the day perfectly. If you can’t have amazing flowers for your wedding, when can you? Any vases or other equipment required to create your look can be hired from us as part of the service; you won’t be left with 10 huge candlesticks after your event… And if you’re looking for something a little more unusual, we can advise you where to find it. As well as being delighted with your flowers on the day, hopefully you’ll enjoy the whole design process. We always aim to provide professional advice and lots of creativity. Book your free consultation and we’ll get the ball rolling. I knew they would be good, but your ability to capture the exact style of the event was incredible! What could be more luxurious than a candelabra dripping with flowers? Evoking the season needn't mean using orange. Here's how! Fashion-forward headwear for the flower fairy in you! The flowers were out-of-this-world beautiful and tied everything together perfectly! I don’t know where to begin with thanking you… Every detail was incredible! All our guests said the church looked unbelievable, which I 100% agree with! Multi-award-winning hair and makeup pros Caroline and Elke are the best in the business. They ‘did me up’ for a party once and I really was amazed! We’ve worked with this pro team of wedding planners and venue managers many times over the years, and always find the process smooth and trouble-free. Polly is super-fun, but also a super-organised professional wedding planner. You’re guaranteed lots of enthusiasm if she helps plan your big day. These guys provide the most beautiful (and coolest) wedding transport around… and the most brilliant customer service. Travel in style! Emma and Ian are one cool couple and know how to take modern, yet timeless pictures. I love working with them and their albums are stunning. Relaxed, creative and passionate… we chose these guys to make our promo video and the experience as a client was second-to-none. Becky photographs weddings beautifully, but also specialises in sophisticated boudoir photography… a great gift for your groom on the big day. Lisa’s locally inspired flavours and contemporary, bespoke cakes are wonderful. She’s also just brilliant at creating oversized designs. If you want your pictures to really tell a story of the day, Mister Phill’s your man! He’s like the stealth ninja of the wedding photography world. Ian creates bespoke stationery… everything from invitations to place cards. He’s also part of Big Bouquet Photography, so really knows his weddings! Diana Saxby writes and conducts beautiful personal ceremonies, perfect for those who wish to marry in unusual locations or outdoors. Tori is like a hair-wizard and a lovely (frequently hilarious) person to have around on the morning of your wedding. Really reliable too. Ben is a brilliant, unobtrusive reportage-style photographer and actually photographed our own wedding. The results were beautiful. Kasia’s pictures are simply stunning and after collaborating on a big photoshoot with her, I can confirm she’s a dream to work with too. Want to have your day captured on cine film for an authentic vintage look? Harry specialises in this, but also makes modern high-res films too. Recognised as one of the world’s top wedding photographers by institutions such as the Federation of European Photographers, David is a true talent and professional. Jen was the most reliable contractor for our wedding… her creative approach is current, she is totally enthusiastic and very professional.